Just a quick post regarding G.ho.st (now moved to Ghost.cc and simply called "Ghost"), a company we took a brief look at last year when looking into the upstart browser-desktop movement. According to their website, "the public Ghost service will be closing on March 15th." 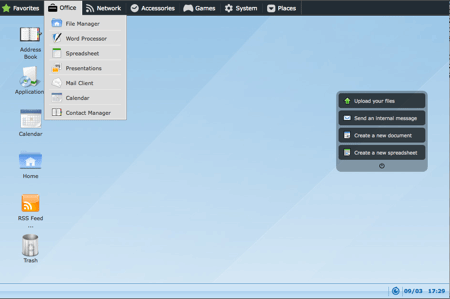 Of the three browser desktops that we profiled, Ghost seemed to have the most comprehensive solution. It worked on many browsers, it had applications for just about anything (except a remote desktop client), and its interface was the easiest to use. All that aside, Ghost was the biggest fish in a nascent market trying to ride the cloud phenomenon into the home. The biggest problem with that is that home users already have desktops and browsers and such to work with, and only a small few care about the cloud. To see if the interest in the browser desktop is falling off before they even got a good footing, let's take a look at the other two solutions that we profiled: icloud and eyeos. I really want to like icloud. They've updated it since the last article to an Aero-like interface, and overall it looks and feels really familiar. You can still take it offline, which is something no other browser desktop can do, but Firefox support is still only in alpha (no Safari support, either). In Firefox, it's painfully slow to load. The menu doesn't behave like it should, especially while it's still loading (and there's no indication of how far along it is). I'm pretty sure I can boot a Win7 box faster than I can boot this browser desktop, so it's a no-go for me as a Mac user. In IE, however, it loads pretty quickly and is quite usable. eyeos is an open-source browser desktop with a host of "local" applications (in that they run natively in eyeos and not from a cloud). I thought this might mean that they would work offline similar to iCloud, but that's not the case. It appears the applications and other components are sent down to the client on demand. eyeos has the distinction of being the only BD that allows the server to be installed in your enterprise and accessed without touching the internet. Glide OS is new to me, and it looks to be a pretty standard browser desktop. Nothing too fancy, but it gets you a desktop-like interface to various web apps. It just doesn't appear to be an enterprise solution. So that's the latest update on the browser desktop space. What do you think? Was Ghost shutting down inevitable, or is it a big loss for the browser desktop cause? Maybe I'm missing something here but I don't understand why I would want to boot my desktop to launch a browser to launch a desktop to launch an application and perhaps a remote desktop session to launch another application. What's the use-case? What does this do that a program neighborhood for remote desktop/apps or a chrome OS for web apps doesn't? The first set of companies that attempted this and survived all evolved into something that was value additive to browser apps - most of them like netvibes and goowy evolved into widget platforms. Same here. Can't see the need for this type of "Cloud OS". Most Corporate firewalls won't allow it- or use it in Enterprise. 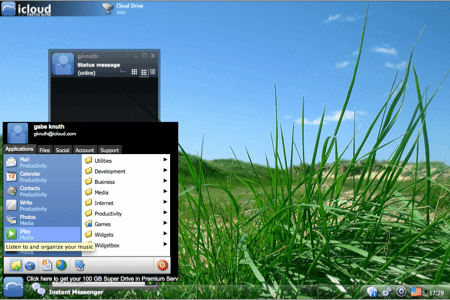 Others use Webmail, others will use an actual remote service such as gotomypc or Logmein. For years the first thing I've always asked about these Web-based Desktops is "WHY???" I think this would be a consumer category first (if it happens at all). The use case is that the user does not need a 'computer' at all but can access a desktop and basic apps through a set-top box. Service providers get to chanrge a premium and we do not have to support all our friends and relatives PCs anymore ;-). There are far too many things that need to be resolved before this could become a corporate solution in the short term. Longer term, possibly. These services cater to such a small percentage of consumers at the moment no doubt these companies are struggling. Lets face it most individuals already have a computer, and if you do its much better to just RDP in your computer wherever you are. Funny, judging by the contents of my inbox you might think the opposite was true - I have e-mails from two new browser desktop providers in my inbox right now. There may still be opportunity in this space but it looks to me to be a risky play, and one that Google could so easily overwhelm if he felt there was a market for this type of service.